I blogged about FinePrint last year. I literally can't overstate how much this application has changed the way I use my computer and my printer. It's a "fake" (virtual) printer driver that basically sits between you and your real printer. You print everything to FinePrint and it gives you an opportunity to mess with the pending print job. FinePrint isn't a print queue or fake printer. It's Tivo for your printer. 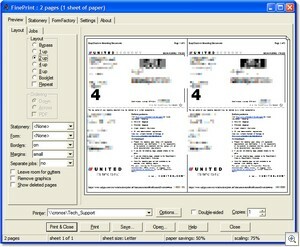 It lets you remove sheets, remove graphics, print 1,2,4 up or booklets. You can print to it, then save the output as a JPEG or TIFF. You can print to the clipboard. One of my favorite features is "Collect Jobs." You can print from multiple applications and consolidate all the jobs into one Fineprint session, remove pages, make changes, then print the whole thing as one print job. The margin adjustment is nice also...you can change the margins after the source app has printed the job. 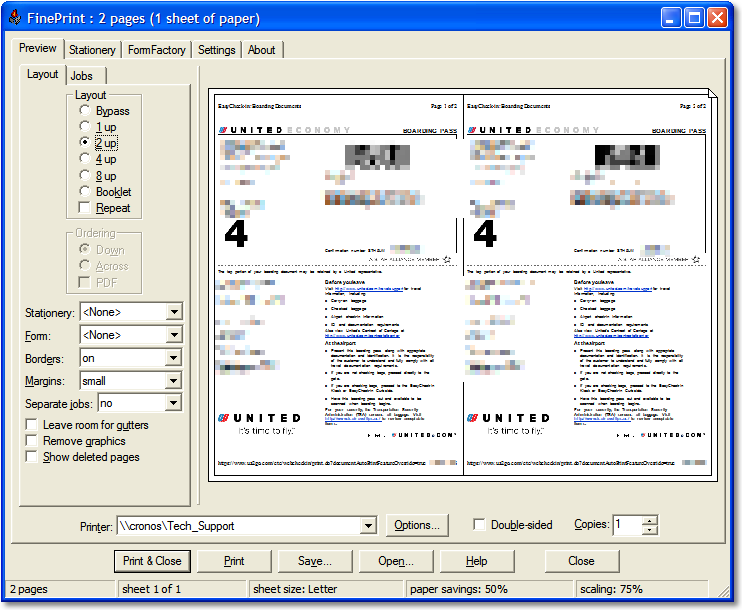 You can also create virtual printer "instances," like one that does double sided, one that does letterhead or watermarks. It also creates an AutoSave folder, if you like, in your My Documents folder with the last, say, 10 documents printed, so you can open the jobs up again and reprint them. You can also use this as an offline printer. I printed a number of things on the plane today and saved them as Fineprint files. (Yes, I know that Windows supports some offline printing, but FinePrint lets you select different printers, while with Windows you can't move jobs between printers.) Then I printed them in the Hilton Business Center when I arrived. All this for $49.95. That's the magic price for me...$50, no way. But <$50, heh, sold. Don't trust just me, though. You can download a trial here. NOTE: I wrote this on my own because I use this tool all the time. Today I needed a TIFF of a Print Job and FinePrint was there to make it happen. I needed to reprint something I'd printed last week and it was saved in my AutoSave folder. When I dig something, I like to share it with other folks. I don't know the guys at FinePrint. I clicked thru to that PCMag review....that's some low "information density" for you right there. I've been using Fineprint for some months now and I totally agree with Scott. I understand his enthusiasm for this tool, I've been the same to co-workers! It is great. I also started using FinePrint (I think it was after I read about it in your blog), and I agree with every word of your post. It is much more than a driver, I recommended to IT in my company to purchase a license after experiencing the trial, I was very sad when it was denied. I must say I don't print much, but even the little that I do was immensely improved by FinePrint the ability to delete single pages out of a large document, merging several prints from several file into a single print job, the booklets, autosave - all of it, a great tool! I'm now in the process of leaving my current job at Interwise (http://www.interwise.com), my first recommendation in the new company (a small startup named collarity http://www.collarity.com) would be this: "Buy it!" Based almost entirely on your write up of the product last year, I bought a copy. It was the best $40 odd I have ever spent! One side benefit for me is because I move from client to client often and have dozens of printers installed. I leave FinePrint set as the default printer in Windows so I don't accidentally try to print to a printer that is not on the network I am currently on. But the utility of the program overall is what has enchanted me. I love the booklet feature for printing mini manuals etc. Keep posting about products you use, I love your tool list and other posts along these lines because they reflect what you actually use day to day, the best kind of recommendation! Absolutely! FinePrint is not only a way to save money (paper, toner, etc) but also help consolidate and keep organized... Visitors - if you don't have it go check it out - well worth the price. Great post Scott. FinePrint has been on my "Great Software List" (http://www.anova.org/software/) for years, as has pdfFactory Pro, as the two apps sync with one another. It's also great for printing Help files to read later. I'm just surprised few other apps even consider what FinePrint has done. FinePrint puts their apps on sale once or twice a year, so if you're looking for a bargain, one should occur soon. Here's one tip for using it, if you're into video games. After you download files of walkthroughs, they're stuck on your computer, nowhere near your XBox. You can use the booklet printing together with large margins in order to print a little book that (with trimming) will actually fit inside the game's DVD case. FinePrint has not only saved several large deciduous forests but has also allowed them to keep the reports on disk rather than in a large storage area. As a bonus, they can now do a Find in the file rather than pouring over 700 hundred pages looking for something. For whatever reason, printing to FinePrint also cut the report time down to under an hour from over two. Rock on FinePrint. Rock on. I use FinePrint. It is a great tool. But I am thinking of switching to a Mac. Is there a Mac alternative? Thanks.